Some of the most unpleasant symptoms of a hangover, such as dry mouth, thirst, dizziness, and headache, develop due to the dehydrating effect of alcohol. Unfortunately, once alcohol is already in the bloodstream, complete hangover prevention is not possible. However, it is possible to reduce the severity of symptoms to enable a person to function normally. Is sleeping off a hangover the best strategy? Is there an effective painkiller for hangover prevention? Read on to learn how to prevent hard times in the morning after a night of drinking too much. Preventing hangovers when drunk: is it possible? Will throwing up before sleeping reduce hangover severity? Does it help to drink water before bed? Do electrolyte drinks before bed help to prevent crapulence? Will taking multivitamins when drunk already prevent veisalgia? Will taking an NSAID when drunk help with hangover prevention? What to eat when drunk to prevent a hangover? Will Before Bed Hangover Prevention Methods Work? Symptoms of hangover typically start when the blood alcohol level falls to zero or near zero. Depending on how much, how quickly, and what a person drank, the symptoms are usually in full effect the morning after a night of heavy drinking. Most people experience some degree of fatigue, weakness, headache, and other symptoms for up to 24 hours. How to prevent a hangover after drinking? Unfortunately, when a person is already drunk, it is not possible to completely avoid feeling hungover. It is possible, however, to reduce the severity of the symptoms. Light and sound sensitivity are common hangover symptoms that can lead to disturbed sleep after a drinking session. How to fall asleep when drunk? Creating a good sleep environment with ambient temperature and blackout curtains helps. This reduces the impact of alcohol and is effective in preventing some of the worst hangover effects. Let’s find out other ways how to prevent a hangover when you’re already drunk. Preventing A Hangover By Vomiting: Is It A Good Idea? Alcohol is absorbed pretty quickly from the stomach into the bloodstream. This means throwing up before bed does not help with hangover prevention. The alcohol is already in the bloodstream, and vomiting out stomach contents will not sober up a drunk person. Vomiting may relieve some symptoms such as nausea. However, forcing oneself to vomit can be dangerous. It can exacerbate the dehydrating effect of alcohol. Besides, stomach acid can damage the esophagus (food pipe). What to drink before bedtime if alcohol causes vomiting? Water and ginger tea rehydrate the body and are easy to keep down. Drink Water Before Sleeping: Is It The Best Hangover Prevention Strategy? Alcohol causes the body to produce more urine, resulting in a fluid loss. The ethanol-induced dehydration is responsible for some of the most horrible hangover symptoms. Drinking a glass of water before bed is one of the best ways of preventing these effects. It is recommended to take small sips of water every 15 minutes. It is also a good idea to keep a glass of water within reach on the nightstand in case one wakes up feeling thirsty in the middle of the night. For the most part, recovery from a hangover needs time, and most symptoms abate in about 24 hours. What to drink before bed for prevention of hangovers? Sports drinks contain electrolytes to replenish what is lost due to alcohol intake. Electrolyte solutions replace sodium, potassium, magnesium, and calcium. These drinks also help retain water in dehydrated individuals and provide energy. Restoring the body’s store of electrolytes can speed up recovery after a night of heavy drinking. The diuretic effect of ethanol causes the body to lose vitamins and minerals while drinking. Taking vitamins before bed is an effective way to combat a hangover. Many people benefit from a multivitamin before bed which contains important vitamins B, C, and folic acid as well as minerals such as zinc and magnesium. The extra vitamins help restore the nutrients depleted by alcohol. They also reduce the severity of a hangover by speeding up alcohol metabolism by the liver. Are there pills to prevent hangovers? Taking a painkiller such as ibuprofen after alcohol may help with some of the symptoms such as headache. Can you drink alcohol with ibuprofen? Taking a small amount of ibuprofen after consuming alcohol is not harmful. However, it is worth remembering that higher than recommended dosages of NSAIDs along with heavy drinking can result in liver damage. The same is true for acetaminophen. The risk of liver damage increases with high amounts of each of these substances in the body. How long after drinking can I take Advil? Heavy alcohol use can exacerbate the side effects of the medication. Also, both substances are associated with an increased risk of gastrointestinal bleeding. It is recommended to consult a healthcare professional for guidance on the best painkiller after alcohol. The average absorption rate of alcohol on an empty stomach is 30 minutes. With food in the stomach, it can take 90-120 minutes for the alcohol to be absorbed. Therefore, drinking on an empty stomach increases the chances of waking up still drunk and suffering from a nasty hangover the next day. The best foods to eat before drinking can prevent a hangover by slowing down the absorption of alcohol. Greasy foods are not a good idea because they can worsen nausea and upset stomach after a night of drinking. If a person is already drunk, what to eat before sleep? Healthy snacks such as a banana or honey on toast are good options as they provide fuel to the body as it recovers through the night. Eating something before going to bed ensures blood sugar levels do not fall too low in the morning. Low blood sugar is associated with symptoms such as fatigue and weakness. Hangover Prevention: What Works And What Doesn’t? If someone has had one too many drinks, preventing a hangover completely is usually not possible. 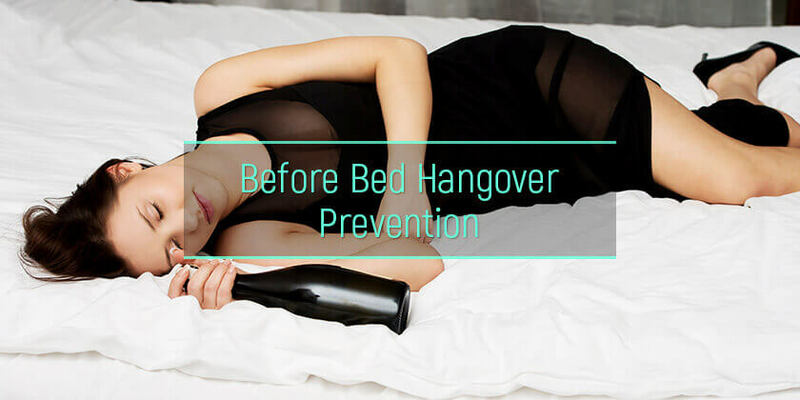 However, there are simple tips on preventing a hangover before bed. Staying hydrated, eating healthy, getting plenty of rest, and taking some electrolyte and vitamin supplements can surely provide some relief. Alcohol abuse is a dangerous practice. Learn more about treating alcoholism and start a new life today. The alcohol dependence rehabs offer a friendly environment and professional approach to recovery.